After tonight’s long-awaited win against the Arizona DiamondBacks the feedback will be very different. Instead of talking about the SF Giants players that DID NOT get a hit, this performance will have us asking which players DID NOT get a hit… but with the emphasis on the who did not. Wait, that is exactly the same wording but with completely different meanings. What I’m trying to say is, we won’t be griping over the players that “didn’t hit the ball” we will be marveling, shaking our heads, smiling and asking “who didn’t hit the ball”. Hmmm…that too seems to be the same also. The two statements appear to be identical in writing but in my head they are different. get hits. After San Francisco’s 6-4 victory in Phoenix tonight we will happily be asking ourselves who did not get a hit. Alright now I am having second thoughts about what I am attempting to write here. It seemed so clear when I began, but now I myself am confused. Okay, got it now. At Chase Field tonight, after a losing streak that was pretty ugly, our bats came alive and it seemed as though everybody hit the ball! Tonight the World Champion San Francisco Giants snapped a frustrating losing streak defeating the Arizona D-Backs by hitting the ball. They hit the ball often. Many of the players hit the ball during this game. As opposed to recent games in which only a few players were hitting the ball. Many players got hits tonight. These hits resulted in runs and we won the game. Whew, that was a brain fry. Okay, obviously I should turn the play by-play over to the experts but we won. Yippee! Making this win even more wonderful was the performance by one of my favorite boys. Even though it is hard for me to have a favorite player on this current squad, I have had a special soft spot for Brandon Belt since February of 2012 when I spent time interacting with this amazing young man. Brandon Belt was the hero tonight and I know how much it meant to him. That’s what makes it so sweet! 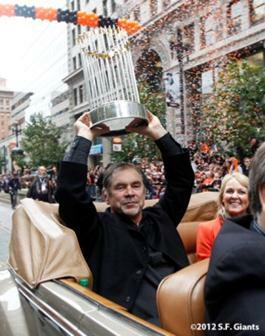 Starting in the 8th position in the lineup would be an obvious ‘demotion’ for Brandon but Bochy had reasons for moving him that are not in any way related to punishing him for poor performance. I like to think that our Skipper is just that good, some sort of super genius Coach who does unexplained things and they turn out to be exactly what our team needed. There is a method to his madness. What matters to me, and most likely to Brandon and the rest of the team, is what Belt did in that 8th position. When you talk about one player being the “hero” of a game you are talking about the kind of player Baby G was tonight. Poor Matty had another rough night. Giving up 3 home runs in the first inning, which was mind-boggling for us all. As one who is protective of these boys, my heart goes out to him and I hope he realizes that this won’t last. Matt Cain is much to talented- so he will snap out of whatever this is soon. Meanwhile it is upsetting but not the end of the world. To make matters worse Pablo Sandoval who has been hitting flawlessly, left the game during the 6th inning because his “elbow was bothering” him. This removed one of our most consistent batters of late. Get well soon Pablo we need you back in the lineup. 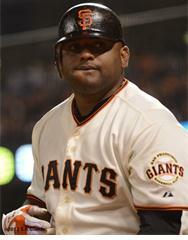 By the time Sandoval was benched Bochy was already gone, ejected for the first time this season. brought a smile to his lips and rightfully so. This was his first homer of the season and I bet it felt great. Then in the 8th Belt once again put the bat to the ball hitting a 2 run 2 out single that pretty much put the game in our pockets. It was Belt’s night and he deserved it. Unfortunately he wasn’t able to help Matt get a win tonight but we will return to greatness one player at a time if that’s what we have to do. I would have been there to celebrate first hand since it is within driving distance from Yuma, a rare perk of living in AZ- I have not enjoyed my time at Chase Field so far and am leery of attending an “away” game there again. It would have been nice to have this kind of game yesterday. I drove to San Diego for Sunday’s game vs. The Padres which we lost, but in those friendlier surroundings it was still an enjoyable day. Getting swept by the Padres wasn’t fun but it wasn’t critical either. They aren’t much of a threat in the big picture , however the D-Backs are a team that could prove to be difficult this year. Obviously we took care of the first game let’s do it again tomorrow!